Greta Garbo famously never married, but had many lovers on screen. We selected twelve postcards with her film partners for today's post. Her favourite co-star was John Gilbert, who was her love interest in Flesh and the Devil (Clarence Brown, 1926), Love (Edmund Goulding, 1927), Woman of Affairs (Clarence Brown, 1928) and Queen Christina (Rouben Mamoulian, 1933) In reality, Garbo left Gilbert standing at the altar in 1927 when she got cold feet about marrying him. John Gilbert. German postcard by Ross Verlag, no. 1886/1, 1927-1928. Photo: Clarence Sinclair Bull / Metro-Goldwyn-Mayer. Publicity still for Flesh and the Devil (Clarence Brown, 1926). In Flesh and the Devil, John Gilbert and Lars Hanson are lifelong friends who fall in love with the same woman (Greta Garbo). Gilbert's more passionate, hot-blooded character forms a believable and interesting contrast to Hanson's innocently earnest portrayal of his loyal, unsuspecting friend. Garbo makes what could have been a stereotyped love interest into a complex and sometimes tormented character. Conrad Nagel. German postcard by Ross Verlag, Foreign, no. 3787/4, 1928-1929. Photo: Metro-Goldwyn-Mayer. Publicity still for The Mysterious Lady (1928). Garbo plays in The Mysterious Lady an attractive Russian spy, who seduces an Austrian officer (Nagel) in order to get some important plans. But she actually falls in love with him, and both are placed in a dangerous situation. John Gilbert. German postcard by Ross Verlag, no. 4133/1. Photo: MGM. Publicity still for A Woman of Affairs (Clarence Brown, 1928). When childhood sweethearts Diana (Garbo) and Nevs (Gilbert) are kept from marrying in A Woman of Affairs, she finally marries another. While Nevs still loves Diana, she does not return to England for seven years - just 3 days before Nevs' wedding to Constance. Nils Asther. German postcard by Ross Verlag, no. 4557/1, 1928-1929. Photo: Metro-Goldwyn-Mayer. Publicity still for Wild Orchids (Sidney Franklin, 1929). In Wild Orchids, 50ish John Sterling (Lewis Stone) and his young wife, Lillie (Garbo) embark on a cruise to Java. The Javanese Prince De Gace (Asther) tries to seduce her, but he's discovered by Sterling. What will he do about it? Conrad Nagel. German postcard by Ross Verlag, no. 5113/1, 1930-1931. Photo: Metro-Goldwyn-Mayer (MGM). Publicity still for The Kiss (Jacques Feyder, 1929). 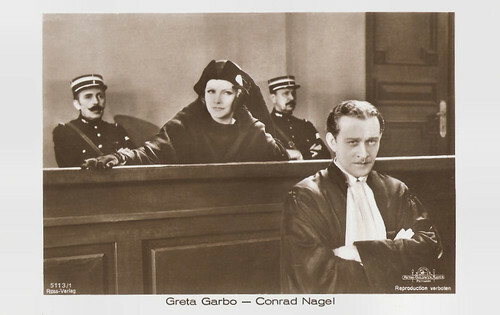 In Greta Garbo's last silent film, Nagel plays her lawyer, who defends her in court after her ailing and financially distraught husband is shot. But he is also her former lover. Clark Gable. German postcard by Ross Verlag, no. 140/5. Photo: Metro-Goldwyn-Mayer. Publicity still for Susan Lenox (Robert Z. Leonard, 1931). Fleeing her cruel uncle and an arranged marriage Susan Lenox (Garbo) falls in love with a kind stranger, the architect Rodney (Gable) but circumstances force her to become a woman of easy virtue. 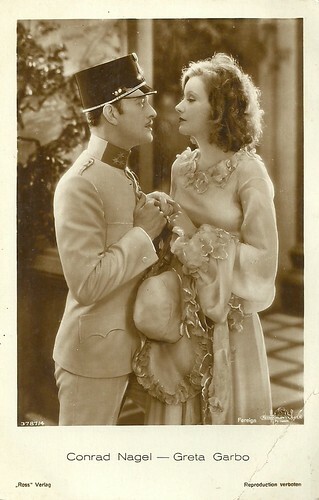 This was Gable's first starring role and he fared well, but he and Garbo disliked each other. She thought his acting was wooden while he considered her a snob. Ramon Novarro. 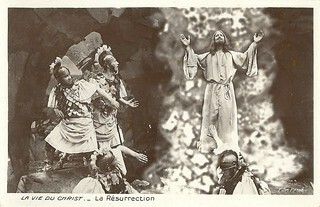 French postcard by EDUG, no. 1030. Photo: Clarence Sinclair Bull / Metro-Goldwyn-Mayer. Publicity still for Mata Hari (George Fitzmaurice, 1931). During World War I, Mata Hari (Garbo) is a German spy, working in Paris. She has already seduced the Russian general Shubin (Lionel Barrymore), and has now set her eyes on lieutenant Rosanov (Novarro), a young up-and-coming officer. In order to get her hand on secret documents in his possession, she spends a night with him. John Barrymore. German postcard by Ross Verlag, no. 7285/1, 1932-1933. Photo: Metro-Goldwyn-Mayer. Publicity still for Grand Hotel (Edmund Goulding, 1932). Barrymore plays Baron von Geigern, who is broke and trying to steal eccentric dancer Grusinskaya's (Garbo) pearls. He ends up stealing her heart instead. Melvyn Douglas. 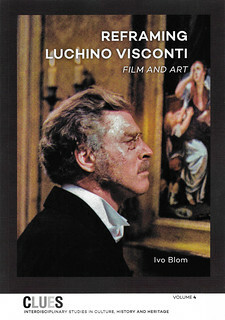 British postcard in the Film Partners series, no. P 82. Photo: MGM. Publicity still for As You Desire Me (Rouben Mamoulian, 1932). Is Budapest bar entertainer Zara (Garbo) actually Maria, the wife of Bruno (Douglas), an officer in the Italian army? Was her memory destroyed during a World War I invasion ten years earlier? Everyone on Bruno's estate is desperately searching for the truth. John Gilbert. German postcard by Ross Verlag, no. 194/3. Photo: MGM. Publicity still for Queen Christina (Rouben Mamoulian, 1933). Queen Christina (Garbo) accidentally and secretly falls in love with an emissary from Spain (Gilbert), but a marriage between the two seems out of the question. She must choose between the throne and the man she loves. 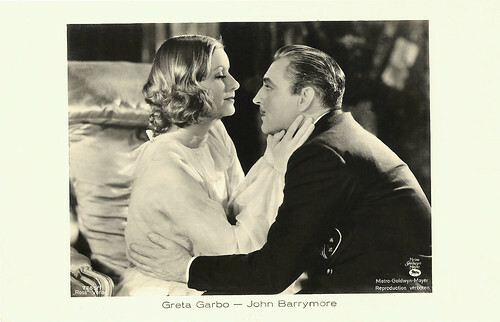 Queen Christina reunited Garbo with her favourite leading man from her silent days, John Gilbert, and the two are again marvelous together. 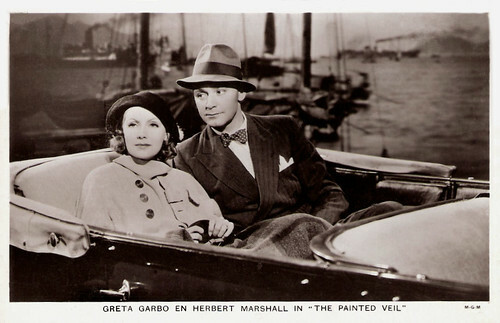 Herbert Marshall. Dutch postcard by M. Bonnist & Zonen, Amsterdam, no. B 422. Photo: MGM. Publicity still for The Painted Veil (Richard Boleslawski, 1934). Garbo plays in The Painted Veil a wife neglected by her husband (Marshall), a medical researcher in China. She falls in love with a dashing diplomatic attache (George Brent). When it is discovered by her husband he becomes very bitter. But while fighting a cholera epidemic the couple grows closer together than ever. Fredric March. German postcard by Ross Verlag, no. 9313/1. 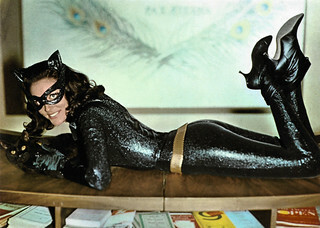 Photo: MGM. Publicity still for Anna Karenina (Clarence Brown, 1935). In this adaptation of Leo Tolstoy's famous novel, the married Anna Karenina (Garbo) falls in love with Count Vronsky (March). Her husband (Basil Rathbone) refuses to grant a divorce, and both lovers must contend with the social repercussions.